Meredith Hockaday, 32, said she was walking her dog in Lighthouse Point, Fla., August 7 when she saw a strange light in the sky. Initially, she thought a plane had exploded, and began taking pictures and video. And then she noticed a strange cloud. At that point, she said, she considered the possibility that it was a UFO, and called her husband "freaking out." But he could not explain the site either. "I would like to say it's a UFO, but I can't say for sure," said Hockaday. "I would like to think they exist, it makes for interesting talk. I believe there is other life out there." Peter Davenport, the director of the National UFO Reporting Center, said the center received 14 reports from Florida on August 7, both written and through the telephone. See UFO sightings from around the world. But according to scientists, the object was a false alarm-it was merely exhaust fumes from a recent rocket launch that had formed crystallized clouds. The Cape Canaveral Air Force Station launched a Delta IV rocket carrying a satellite from their space launch complex on August 7. 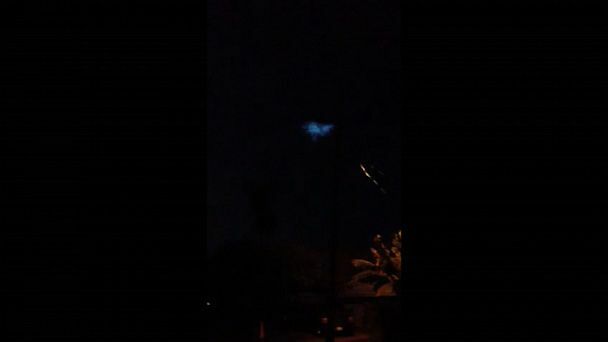 "Did you see the bright clouds following tonight's Delta IV rocket launch?," The U.S. National Weather Service in Melbourne, Fla., wrote on its Facebook page. "We believe they are a form of "noctilucent clouds" that are sometimes present in the mesosphere at a height of 240,000 to 280,000 feet! Since the sun was still shining at that height, the ice crystals that formed in the rocket's exhaust appeared quite bright." Davenport said one of the callers, who was very familiar with rocket launches, had seen something right after the launch with which she was unfamiliar and "had no explanation," leaving open the possibility that something could have been in the sky in addition to the clouds formed by exhaust fumes.